Teaching your children good oral hygiene at a young age is very important. The American Academy of Pediatric Dentistry says a good starting time for that first dental exam is when your child is age one. 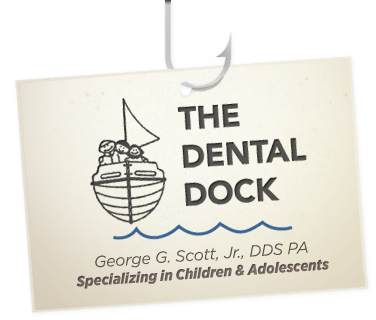 You, the parent, can help to make the first visit to The Dental Dock enjoyable and positive. You should inform your child of the visit and tell them that Dr. Scott and staff will explain all procedures and answer any questions. The best gift you can give your child is a happy and healthy smile. That is why regular dental visits are so important. During your child’s first visit the doctors at The Dental Dock will be able to examine your child’s mouth, take dental radiographs if needed, and do a complete exam of the growth and development of oral structures, including teeth. A thorough cleaning of the teeth, application of fluoride, as well as a diet review will help your child maintain good oral health for the years to come. We promise your child’s first dental visit will be a pleasant experience. Our goal, along with that of our staff, is to help all children feel good about visiting the dentist and to teach them how to care for their teeth. From the design of our office to how we communicate with patients, our priority is doing what is best for your child.